The pylon stands 7 feet tall and weighs only 20 lbs and is constructed from high-strength T6 aircraft aluminum. This pylon requires NO INSTALLATION, meaning you can literally open the box at the lake and have it up in just a few minutes - Instant Gratification! No Tools Required - Just set it up and go, right out of the box! No Expensive Or Permanent Installation Necessary! No Drilling Or Cutting Into Your Boat! Patented Universal Design Fits Any Boat Without Tools! Selective 6' or 7' of Height - Like Two Pylons In One! Can Be Moved From One Boat To Another With Ease! Light Weight Design Sets Up In Just Minutes! Completely Padded For Increased Safety And Comfort! Padding stays cool under the sun! Stainless Steel Hardware Lasts For Many Years Of Intense Use! Heavy-Duty Nylon Cover Withstands Harsh Environments! Costs A Lot Less Than A Wakeboard Tower! Lower Insurance Cost Than A Wakeboard Tower! Have the board and the jacket but don't own a boat? No Problem! Many of our customers buy our pylons because they are the only pylons that can move from boat to boat with ease! Now you can get the air you deserve with your friends' boat! 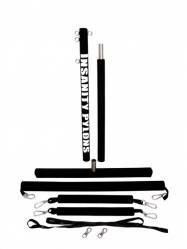 This Insanity Pylon (SKU #INP07A) is drop-shipped directly from the manufacturer and comes with free support! You can get more information on the Insanity Pylon and the manufacturer by visiting their website at www.InsanityPylons.com. For pictures, video clips, instructions, accessories, FAQ's, and more please visit our website or inquire. LOVE IT! It is very stable and sets up quick. Padded cover stays cool in the sun so my kids don't burn themselves. A+ design!